you would like calibrated, and we will forward a written job estimate to you. 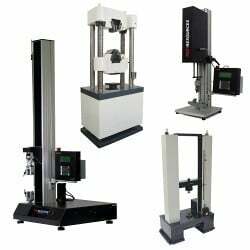 Tensile & Compression Machines: $450.00 for the first machine - $225.00 for each additional machine done on the same day. Load Cells - Tension & Compression: $450.00 for the first load cell - $225.00 for each additional load cell done on the same day. Note: Any machine or load cell calibrated in both tension & compression will be charged double. Any machine or load cell with more than four ranges will be charged $50.00 for each additional range. Position Displacement or Crosshead Speed Verification: $175.00 when done with machine calibration - $350.00 if done separately. Extensometers & Clip Gages: $125.00 per extensometer or clip gage when done with machine calibration - $250.00 if done separately. Note: Extensometers & clip gages also have a maximum daily charge of $700.00. Creep & Stress Rupture Machines: $250.00 for the first machine - $125.00 for each additional machine done on the same day. Note: Creep & stress rupture machines also have a maximum daily charge of $700.00. Impact Machines: $550.00 for the first machine - $275.00 for each additional machine done on the same day. Note: NIST samples not included in price and are the responsibility of the customer to acquire. Brinell Machines: $300.00 for the first machine - $150.00 for each additional machine done on the same day. Note: Only the most expensive piece, of the above listed equipment, will be charged full price. All other equipment, calibrated on the same day, will be charged half price. For equipment requiring an ISO 17025 accredited certificate, the following surcharges will apply. $50.00 for the most expensive piece of equipment calibrated, $25.00 for each additional piece of equipment calibrated on the same day. For equipment charged on a daily rate, add $100.00 to the daily rate charge. Surcharge does not apply to Impact machines, position displacement or crosshead speed verification. $500.00 per day for a service call - $250.00 for a service call of less than two hours. Note: When being done during scheduled calibration, most repairs are not charged. Mileage: 54 cents per mile.